The Sincpac C3D for AutoCAD Civil 3D was designed and created by actual users of Civil 3D - people attempting to use Civil 3D "in the trenches". As such, it addresses many of the real-world weaknesses of Civil 3D, and adds more than 150 new commands and features to Civil 3D 2008 and above. All utilities are entirely designed inside of Civil 3D, extending and enhancing the built-in Civil 3D functionality, and using default Civil 3D entities. The Sincpac C3D creates no custom entities in your drawings, and your drawings may be shared freely with those who do not have the Sincpac C3D. Since Civil 3D itself is stronger for Engineers than for Surveyors, the Sincpac C3D features many commands that are geared specifically toward Surveyors. But it also contains many features that any user of Civil 3D will find welcome. If you already thought Civil 3D was powerful, just wait until you turbo-charge it with the Sincpac C3D! While the Sincpac C3D does include the handy PtConnect command for connecting Cogo Points, it is not intended to be a field-to-finish solution. 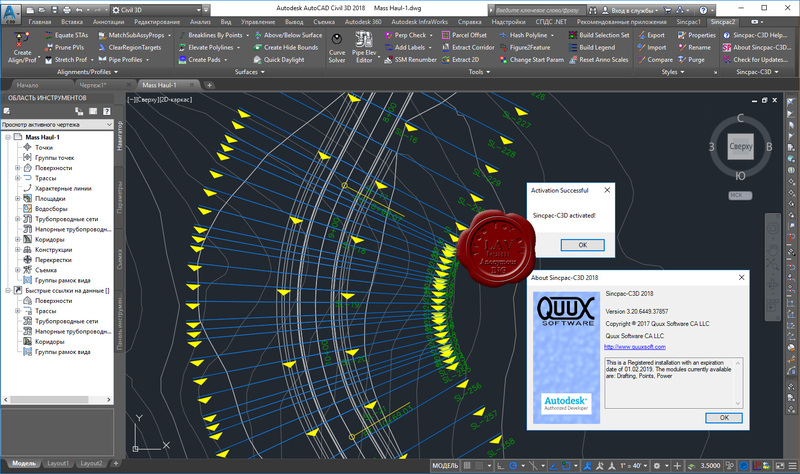 There are enough offerings for that, including the new linework features introduced in Civil 3D 2010, and we assume you have that part of your task covered. Likewise, it is not another file format converter, or piece of traverse adjustment software. Again, those areas are well-covered by other sources. Instead, the Sincpac C3D contains a large number of tools that come in handy for any user of Civil 3D. Many people have said that they have grown to think of the Sincpac C3D as the "Express Tools for Civil 3D", because of the way it enhances so many basic tasks. However, there are many other tools, such as the Dynamic Reporting tools, which can be found nowhere else. 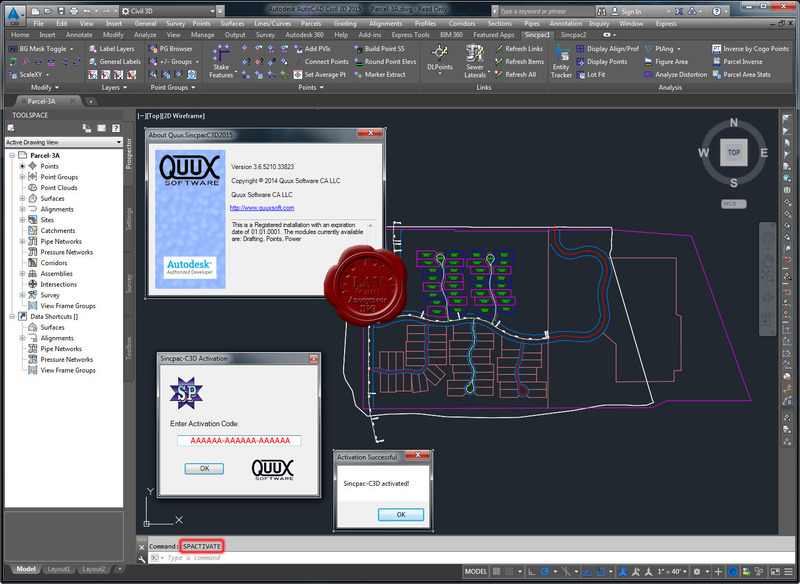 The Sincpac C3D features dialog boxes with pop-up help that explain most of what you need to know, so you can start using most Sincpac C3D features without even reading the help file. However, complete help is also included, and most commands also feature context-sensitive help that can be activated by hitting the F1 key on your keyboard. You can review the complete help file on-line to see in detail what commands are available in the Sincpac C3D. Additionally, the revision history of the Sincpac C3D may be found in the change log. - Create alignments and profiles in a variety of ways, such as from 3D-Polylines, from Feature Lines, or by selecting Points, among others. - Create Dynamic Links between various Civil 3D elements. - Create Dynamic Station/Offset and Cut/Fill tables. - The so-called Dynamic Reporting tools, which are actually incredibly powerful, multi-function, interactive interfaces that must be experienced to be believed. - Extract linework and points from Civil 3D elements and XREFs. - Style Management: Import or Export Civil 3D Styles between drawings, Search and Replace on Civil 3D Style names, or Compare two drawings to see what Styles exist in each drawing. - A Curve Solver - type in any two parameters for a curve, and solve for the remaining parameters. - The incredibly-handy Entity Tracker, which reports a lot of useful information about items under the cursor. - Stretch and Move Profiles. - Check parcels for gaps and mark perpendicular and radial intersections. - Create parcel offsets with different front, back, and side offset distances, for lot setbacks and easements. - Export Cogo Points to a KML file, which can be loaded into Google Earth. - Select Points by Point Group, ID which Point Groups a Point belongs to, and add and remove Points to and from Point Groups by right-clicking. - Enable automatic update of Civil 3D Point Groups. - A Point Group Browser allows for fast adjustments to styles and override settings, and displays an editable list of points that are currently in the selected Point Group. - A point-creation command that can add points to point groups by number as they are created, using elevations from 3D linework, and more. - Numerous routines for datum-adjusting Points. - Move and Scale Cogo Points without changing their elevations, regardless of your OSNAPZ settings. - Find and Replace text in Parcels and Points, with an option to use regular expressions. - A Drawing Log feature, which logs drawing open and close times, along with total edit time for each drawing. 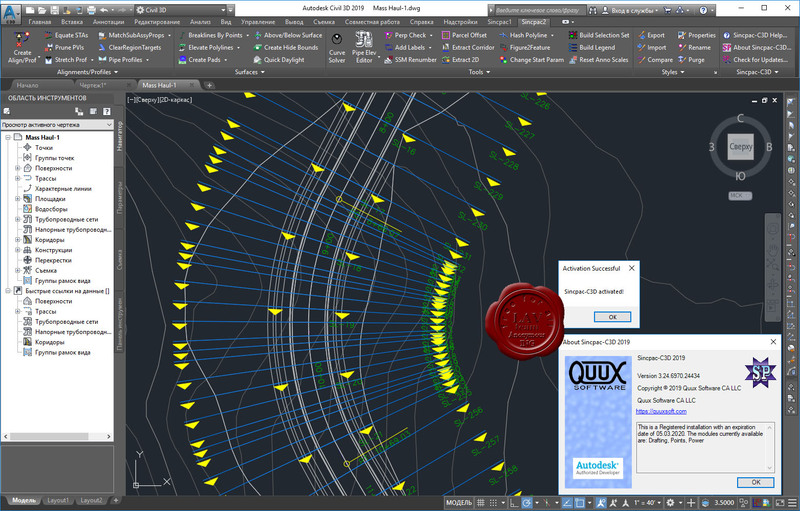 Create alignments and profiles in a variety of ways, such as from 3D-Polylines, from Feature Lines, or by selecting Points, among others. 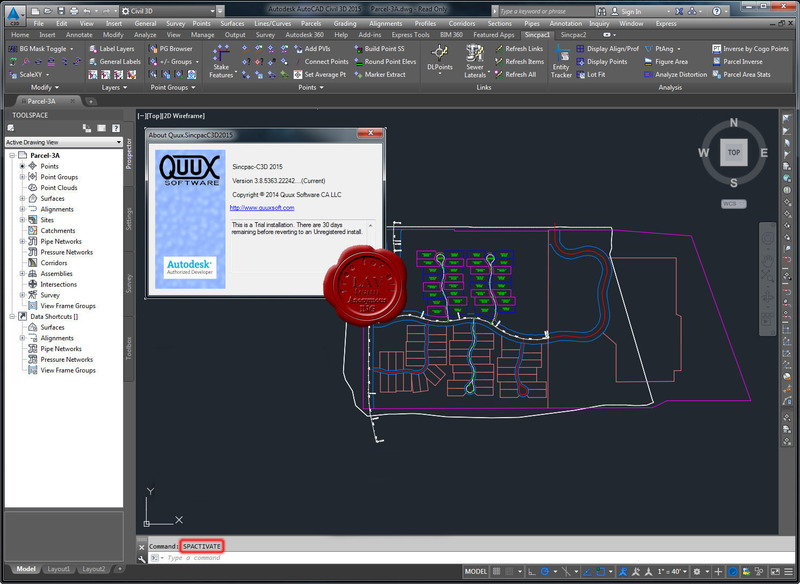 Create Dynamic Links between various Civil 3D elements. Create Dynamic Station/Offset and Cut/Fill tables. The so-called Dynamic Reporting tools, which are actually incredibly powerful, multi-function, interactive interfaces that must be experienced to be believed. Extract linework and points from Civil 3D elements and XREFs. Style Management: Import or Export Civil 3D Styles between drawings, Search and Replace on Civil 3D Style names, or Compare two drawings to see what Styles exist in each drawing. A Curve Solver - type in any two parameters for a curve, and solve for the remaining parameters. The incredibly-handy Entity Tracker, which reports a lot of useful information about items under the cursor. Check parcels for gaps and mark perpendicular and radial intersections. Create parcel offsets with different front, back, and side offset distances, for lot setbacks and easements. Export Cogo Points to a KML file, which can be loaded into Google Earth. Select Points by Point Group, ID which Point Groups a Point belongs to, and add and remove Points to and from Point Groups by right-clicking. Enable automatic update of Civil 3D Point Groups. A Point Group Browser allows for fast adjustments to styles and override settings, and displays an editable list of points that are currently in the selected Point Group. A point-creation command that can add points to point groups by number as they are created, using elevations from 3D linework, and more. Numerous routines for datum-adjusting Points. Move and Scale Cogo Points without changing their elevations, regardless of your OSNAPZ settings. Find and Replace text in Parcels and Points, with an option to use regular expressions. A Drawing Log feature, which logs drawing open and close times, along with total edit time for each drawing.